This is a set of default replacement eyes that have a bit of color and sparkle. 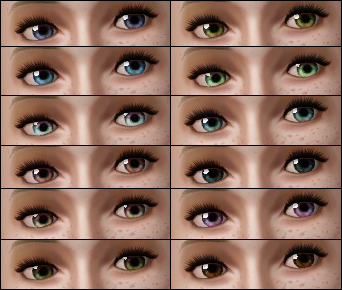 The eyes have a tint of purple, blue, and blue green to them that mixes with the eye color you chose in CAS to create a dynamic, multicolored eyes that look interesting and attractive. The alpha also includes small speckles of white so that when you chose a darker eye color, you can see a subtle glitter in the eye. Install these like you would any other .package file, but if you have any other default eyes you must remove them before installing these. After installing, delete the simCompositorCache.package from My Documents\Electronic Arts\The Sims 3 to have existing sims take on these eyes. Eeeek OMG Winter your avatar is freaky! These eyes are beautiful, I won't be downloading right now because atm I'm happy with the ones from Sim e'Napule but I just had to say I love your sim. She looks like a cat Person, I'd love it if you uploaded her. I'll post this as a thanks though because I do love the eyes and the sim, Great job.I think she's only the second very unique Sim I've seen in sims 3 the other is Michael Jackson. BTW I think those white eyes look amazing. Gorgeous Gorgeous!! I will DLing these right now and replacing the ones I have. Thanks! These are super super pretty! Awesome job. Yeah, agree with all the comments. I think they are the most beautiful eyes till now, unfortunately the irises are too big. I personally kind of liked the eyes in game, and I was always ehh on the other eye replacements, but I think I will really download these! Thank you!! These eyes are absolutely gorgeous! You've actually inspired me to get back into playing the Sims again. I played it once and then turned it off but I'm going to go back to playing it now! Thanks!! So far, these are the eye replacements I've played with the longest. PERFECT! These are exactly the eyes I was hoping to find, they're absolutely gorgeous! Thanks! I wanted to add that I was looking for a permanent eye-type, not something to just use for a while, so I've been really searching. Since we only have the option to use one eye-type in-game, I wanted the eyes I finally chose to be, well... the *PERFECT* replacement for the game originals... and, as far as I'm concerned, I think these are. I LOVE them! I love it!!!!!!! ^^ Great work... Thanks a loooot!!!! I love those. My favourite types of eyes are big and sparkly, not many of those around. Thank you! Who cares what you do? Who cares what you say? That's the altitude, don't be normal... Yay! so wonderful, I love them! These are gorgeous, great job. I would download them but I prefer the eye replacements I already have. If these were smaller I would TOTALLY choose them over the ones I have. Hey, you've been gone a long time, but I thought I'd drop a note to say that I've tried out a lot of default replacement eyes at this point, and these are still my favorite.